Can I adjust the contrast of the screen? No, but you can change the color of the screen background to suit your preference. See below. 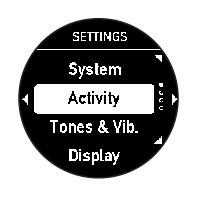 You can adjust the device screen to display one of a variety of digital or analog watch faces. You can also select the color of the screen background. At the Time screen, press the Enter button. Select one of the available watch face designs. Select a Black (default) or White background for the device screen.